At today’s meeting of Prime Minister Ana Brnabić and Ambassador of China to Serbia H.E. Bo Chen, it was confirmed that Prime Minister Brnabić and Premier of China Li Keqiang will meet during the forthcoming Summit of 16 countries of Central and Eastern Europe and China, which will be held on 11-12 April in Dubrovnik. 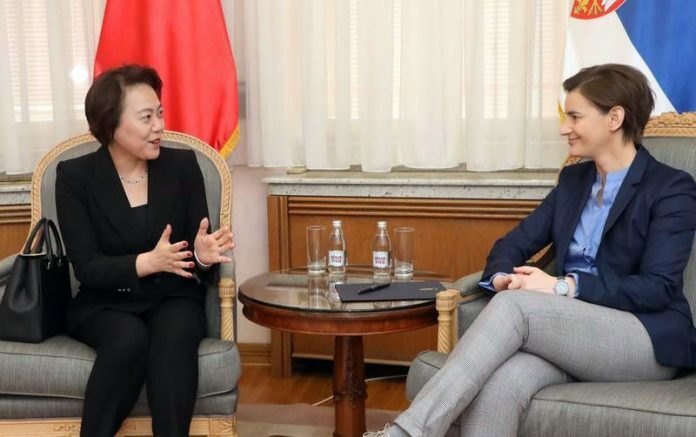 Prime Minister Ana Brnabić expressed her gratitude to Ambassador Bo Chen for the political and economic support that Beijing provides to our country, stating that China is one of the most important international partners of Serbia and one of the largest investors. The Prime Minister pointed out that there is much that joins two friendly nations, noting that through history, Serbia and China have never had closer and better relations than in the past few years, which, she added, noting that this is partly the result of the great mutual respect of President Xi Jinping and Serbian President Aleksandar Vučić. The topic of the discussion was an investment of €800 million from the Chinese company Shandong Linglong in the opening of the rubber factory in Zrenjanin, the arrival of the automotive parts factory Mint in Loznica, as well as the investments of the Chinese partners in Železara Smederevo and the strategic partnership of RTB Bor and the Chinese Zijin. Brnabić reminded that Chinese companies in Serbia are implementing a number of major infrastructure projects within the “Belt and Road” initiative of President Xi and within the framework of the 16+1 cooperation mechanism, in which Serbia is the most active country. Ambassador Chen expressed her gratitude to Serbia for its excellent cooperation and hospitality, and at the same time congratulated Brnabic on the occasion of the successful organisation of the Digital Summit of the Western Balkans, which is being held in Belgrade. The officials paid special attention to cultural cooperation, which is in constant progress. At the end of last year, the Cultural Centre of Serbia opened in Beijing, while works are underway in Belgrade to build the largest Chinese cultural centre in Europe.